The night mode feature is now an important feature in the browser or the system itself, mainly due to the fact that dark colors are more pleasing to the eye when using the computer in the dark. Many popular websites have started adding this feature and making it available to users. Unfortunately, most websites don't offer this option. To overcome this problem; an add-on called 'Dark Reader' take care of your eyes and activate dark theme for night and daily browsing. 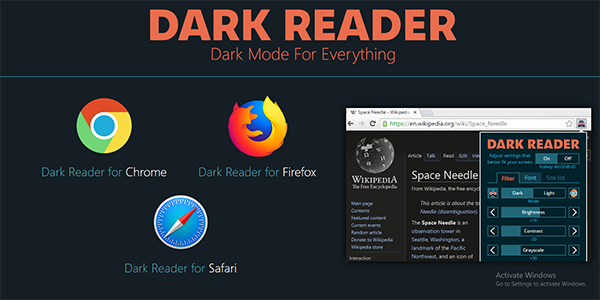 Dark Reader is a free browser add-on for Google Chrome, Mozilla Firefox and Safari. This eye-care extension enables night mode creating dark themes for websites on the fly. Dark Reader inverts bright colors making them high contrast and easy to read at night. To enable the extension, click on Dark Reader icon and click the switch button. Or you can use the shortcut 'Alt + Shift + D' to on/off dark mode quickly. Once enabled, all websites will be shown in their dark design. Otherwise, you can adjust the brightness by sliding the cursor in any direction. Also, you can adjust the contrast as well as Sepia or Grayscale. Set all these options so you can get the best experience while browsing the web. The level of customization provided by this tool is simply stunning, and you can easily create a combination that will fit you. 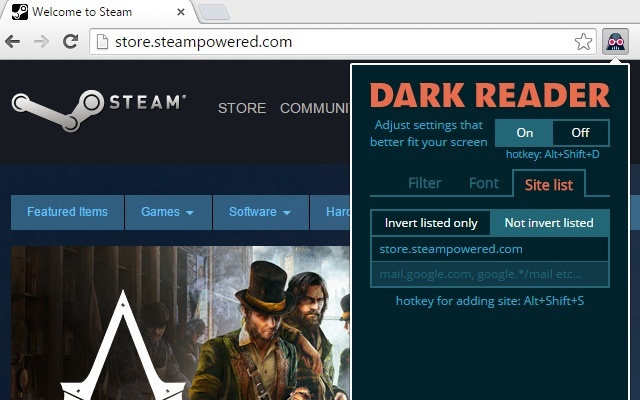 Finally, this extension lets you adjust fonts of any web page. Just switch to the font settings page and select the font that you want.